The LDW system operates above approximately 45 MPH (70 km/h). ● When you operate the lane change signal and change traveling lanes in the direction of the signal. (The LDW system will become operable again approximately 2 seconds after the lane change signal is turned off.) ● When the vehicle speed is less than approximately 45 MPH (70 km/h). The LDW system is turned on or off using the settings menu in the vehicle information display. The LDW light on the instrument panel will light up. The LDW light on the instrument panel will go out. “Settings” displays in the vehicle information display. Use the to select “Driver Assistance”. 2. Select “Driving Aids”, and press the ENTER button. ● Select “Lane” and press the ENTER button. – On roads where there are multiple parallel lane markers; lane markers that are faded or not painted clearly; yellow painted lane markers; nonstandard lane markers; or lane markers covered with water, dirt, snow, etc. 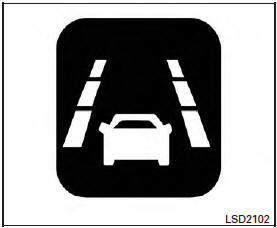 – On roads where the discontinued lane markers are still detectable. – On roads where there are sharp curves. – On roads where there are sharply contrasting objects, such as shadows, snow, water, wheel ruts, seams or lines remaining after road repairs. – On roads where the traveling lane merges or separates. – When the vehicle’s traveling direction does not align with the lane marker. – When the road surface is very dark due to weak ambient light or impaired tail lamp. ● When driving on a curved road, warning will be late on the outside of the curve.